Definition: The motor that converts the alternating current into mechanical power by using an electromagnetic induction phenomenon is called an AC motor. This motor is driven by an alternating current. The stator and the rotor are the two most important parts of the AC motors. The stator is the stationary part of the motor, and the rotor is the rotating part of the motor. 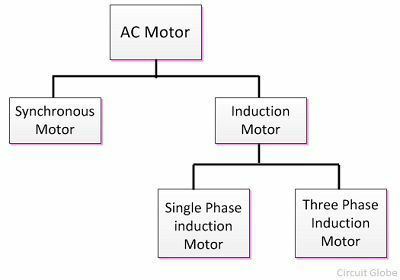 The AC motor may be single phase or three phase. The three phase AC motors are mostly applied in the industry for bulk power conversion from electrical to mechanical. For small power conversion, the single phase AC motors are mostly used.The single phase AC motor is nearly small in size, and it provides a variety of services in the home, office, business concerns, factories, etc. Almost all the domestic appliances such as refrigerators, fans, washing machine, hair dryers, mixers, etc., use single phase AC motor. The AC motor is mainly classified into two types. 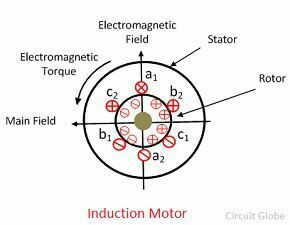 They are the synchronous motor and the induction motor. The motor that converts the AC electrical power into mechanical power and is operated only at the synchronous speed is known as a synchronous motor. When supply is given to synchronous motor, a revolving field is set up. This field tries to drag the rotor with it, but could not do so because of rotor inertia. Hence, no starting torque is produced. Thus, inherently synchronous motor is not a self-starting the motor. The machine which converts the AC electric power into mechanical power by using an electromagnetic induction phenomenon in called an induction motor. The induction motor is mainly classified into two types., i.e., the single phase induction motor and the three phase induction motors. In an induction machine the armature winding serve as both the armature winding and field winding. When the stator windings are connected to an AC supply flux is produced in the air gap. The flux rotates at a fixed speed called synchronous speed. This rotating flux induces voltages in the stator and rotor winding. If the rotor circuit is closed, the current flows through the rotor winding and react with the rotating flux and a torque is produced. In the steady state, the rotor rotates at speed very close to synchronous speed.